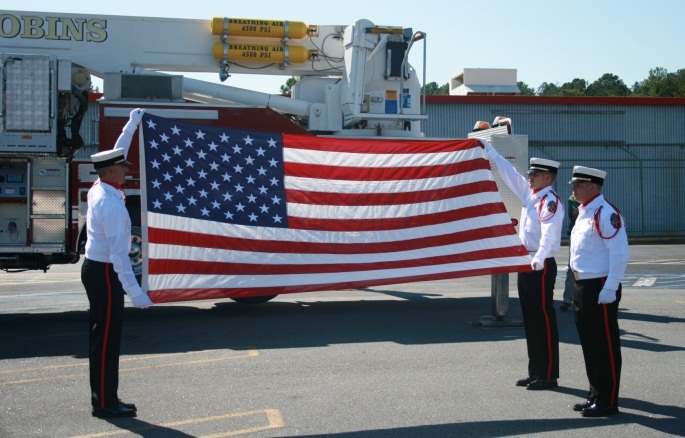 The Warner Robins Fire Department Honor Guard is a ceremonial unit formed of volunteer members. It was originally formed in 1995 with 11 members. Today, the Honor Guard is composed of 10 members and actively seeks individuals that are highly motivated and show aptitude for ceremonial duty. The primary role of the Honor Guard is to provide funeral honors for fallen comrades. They also serve as guardians of the colors by displaying and escorting the national flag as well as the state flag on ceremonial occasions. The Honor Guard is continually practicing and honing their precision drill movements to maintain a professional and cohesive unit. Our Honor Guard is dedicated to preserving the traditions of the fire service and serving the community with a high level of honor and professionalism.